OK - so something has caught your eye, and you've identified what that "something" is - now how are you going to compose the shot. Let me start off by saying that all composition "rules" are meant to be broken - there is no correct way to compose a photograph - but there are a few guidelines that may help in getting that special shot. Knowing these guidelines and when to adhere to them or ignore them is the key to a successful photograph / photographer. Too many times people will see something and think, "That would make a great photograph - let's get closer so I can get a shot" - only to find that, once closer, the "shot" doesn't exist anymore. That's because the perspective - the relationship between the subject and elements in front of and behind - has changed. Once you "see" your "shot", where you saw it is the place from which you need to take it. 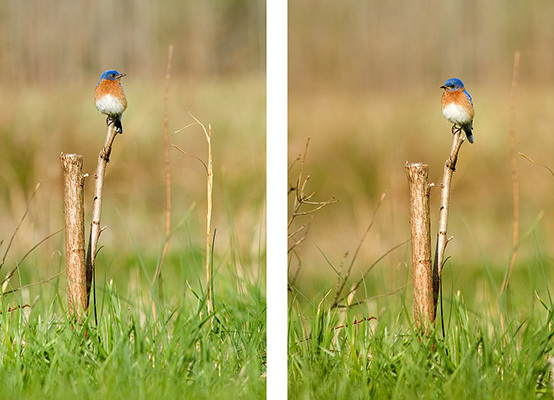 You then select a lens focal length that will compose the image the way you want it. A lot of people think that different lenses produce different perspectives - not really true. From any one location shooting the same subject, ALL LENSES WILL GIVE THE SAME PERSPECTIVE. Now, a wide angle lens will include a lot more field of view than a telephoto, but the perspective is the same. For the most part, photographs with the subject dead center appear flat and, well, boring. Placing the subject off-center usually creates a more interesting image - and a good rule to guide you in this off-center placement is the Rule of Thirds. 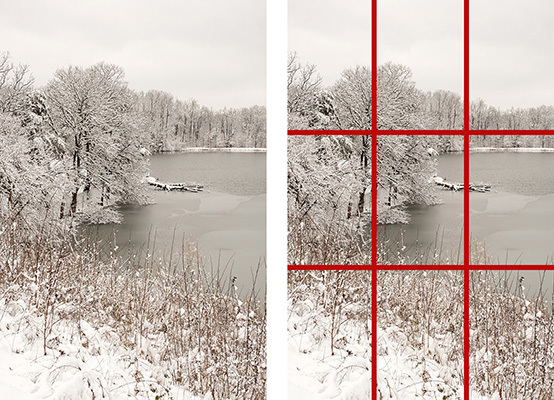 If you divided you image space into thirds horizontally and vertically, the intersections of those divisions are good starting points for subject placement. The actual divisions are useful as well. For example, when shooting a vast landscape, resist placing the horizon in the center of your composition. Try placing the horizon in the top or bottom third of the image. Which one? - depends - if the sky has some dramatic cloud structure or interestingly stormy, place the horizon low to include more sky. If the sky is kinda drab and uninteresting, place the horizon high to incorporate more of the colorful fall foliage. Kinda gets back to "identifying your subject" - are you shooting an interesting sky or beautiful fall colors. 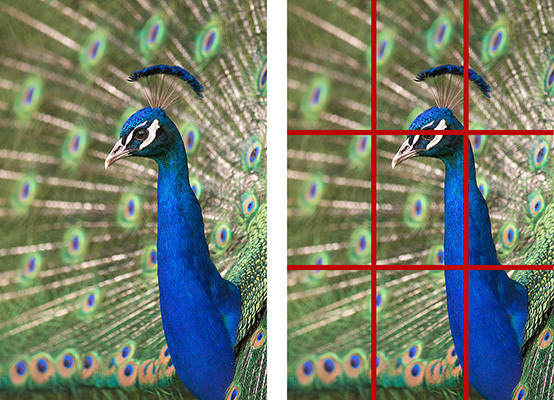 The shot above was composed with the Peacock's neck positioned at the right "third" of the image, and the eye at the top "third". In the image above, I placed the horizon in the top third of the image (not much going on in the sky, so why keep it in) - and located the large tree at the upper left intersection of the thirds. The foreground (which is pretty much at the bottom third of the composition) makes a nice line that the the eye follows into the image. Note how the left shore of the lake extends to - you guessed it - the right third of the composition. OK - I've identified my subject and I want to put it into one of those "thirds" - but which one? Just about any subject will have an "implied direction" - it just kinda looks like it's facing or moving or coming from a certain direction. Give it some room to enter the composition. For example, if I'm shooting some sort of flower, at it "appears" to be looking down and to the left, place it in the upper right "third" of the composition - this gives the flower enough space in your composition to "look into"
In these two photographs of the same subject, I've adjusted the composition for the "implied direction" I felt - in this case, the direction that the bird was facing. I composed the imaged to leave some room for the bird to "look into". Up Next - Some More Composition Tips And Tricks!